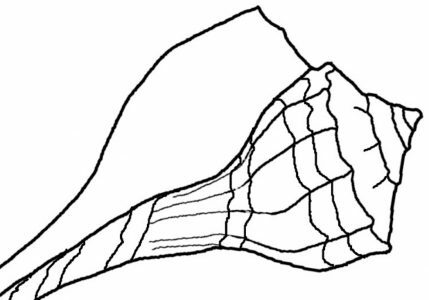 The cockle shell is easy to confuse with the ark shell. Arks are the ones you are most likely to find along Florida’s east coast beaches. Both types live in the sand near beaches, so it figures that their empty shells would be washed up on shore once the mollusk dies. Arks are fairly small in comparison to the Atlantic Giant Cockle, pictured here. The Giant Cockle can grow to be 5.5 inches. The shape of the giant cockle when closed, makes a heart. Therefore, it is also known as the “heart cockle”. Sorry, my shell is not very pretty, but you can see the heart shape. Ark shells begin white, and can change color. Shells that are brown, rust color, pinkish and yellow, turn that way from long term exposure to the air. Black shells have darkened because of iron sulfide in the sand in which they are buried. Arks don’t grow as large as the giant cockle, with their max size being around 4.5 inches (the Cut-ribbed ark), but the ones I find are 1-2 inches. Within the ark population there are various types of arks, which I will get to later on in this blog. But all arks can be found on all Florida beaches. Although I find both types of shell often, the larger cockles are usually spotted away from the area of the crashing waves. I find the big ones, usually still hooked together, out on the flats in the backwater areas at low tide. Can you find the 3 cockle shells in this photo? The arks and cockles resemble each other, unless you look closely. Arks tend to curve a bit at the top. Below I have one of each type side-by-side. They are similar in color and size, but it should be apparent that they are not the same type of shell.